Truth be told, I have not always been a fan of evening routines. There were times in my life where I may even have skipped one or two nightly facewash’s (honesty has always served me well #RealTalk). But obviously, once I was headed to esthetics school in Germany all those years back, I’ve learned that not washing your face at night is about as bad as it gets. Big no no-don’t ever do that again-kind of bad. You want to prevent aging, break outs and lackluster skin- you have to wash your face. No way around it. And recently I even stepped up the nightly wash and started to derma roll. I. AM. ABSOLUTELY. OBSESSED. I start of by getting my Makeup Eraser towel moist with super warm water. Nothing gets me into the ‘this-is-my-time-to-wind-down-and-I-need-to-enjoy-it’ mood better than just soaking up the days worries and makeup/pollution/dirt. 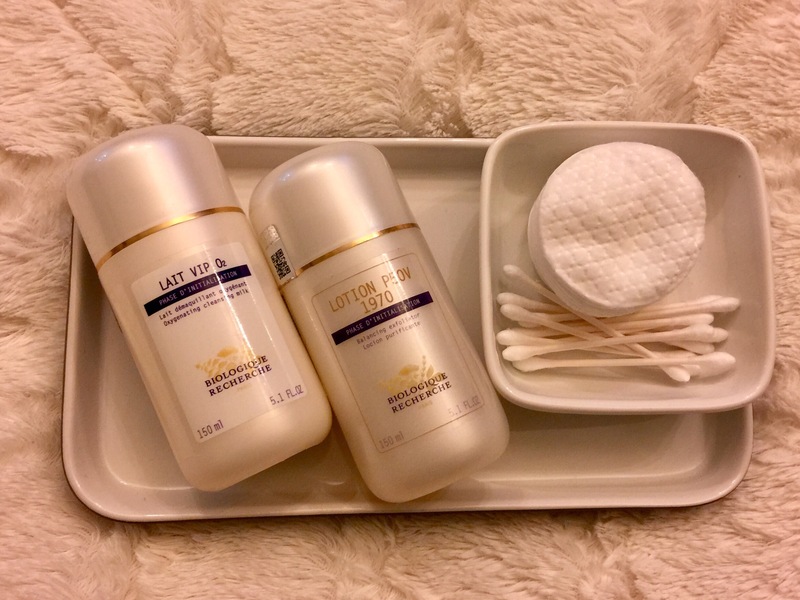 I remove the most of my make up with the towel and then cleanse my skin with a small amount of the Lait VIP O2 followed by what I call the holy grail of all the exfoliator lotions, the Lotion P50 V 1970. This lotion (and the word ‘lotion’ is not doing this product justice -think more like liquid goddess that will change your skin and you’re halfway there), which gently exfoliates, purifies and regenerates the epidermis has been a game changer in my routine. Combined with the nightly derma rolling, this has absolutely made a huge difference in how my skin looks and feels. Derma rolling that is. Last spring, I had the professional treatment done by my dermatologist, the Micro Pen Vampire Facial, and I liked it. Doing more research on derma rolling at home, I ordered my Derma roller (mine has 540 needles and is .03) and included it into my routine. The results are amazing. My skin is more clear, my pores are smaller and even my chickenpox scar is getting lighter. I roll every single night for about 5-7 minutes, I always follow up with my serums as derma rolling opens the channels of your pores and product is able to penetrate so much better into the lower layers of your skin. I also derma roll over my lips. Dreamy! My nightly serums are applied one after the other, Serum Placenta is a skinrepair serum that revitalizes the skin and I massage it in paying special attention to my under-eye area. I follow up with Serum Erythros, and as the name suggests that helps with calming some redness I have on my cheeks. The combination of both quintessential serums after derma rolling is absolutely fantastic. I’m all about lashes and brows. (A few of my readers and friends, like Michele From The Pink Shed, are going to agree that I can talk about lashes and brows for days. Literally days.) Next to amazing skin, good lashes and brows are where it’s at for me. A little help never hurts, I have been a big supporter of growth serums. 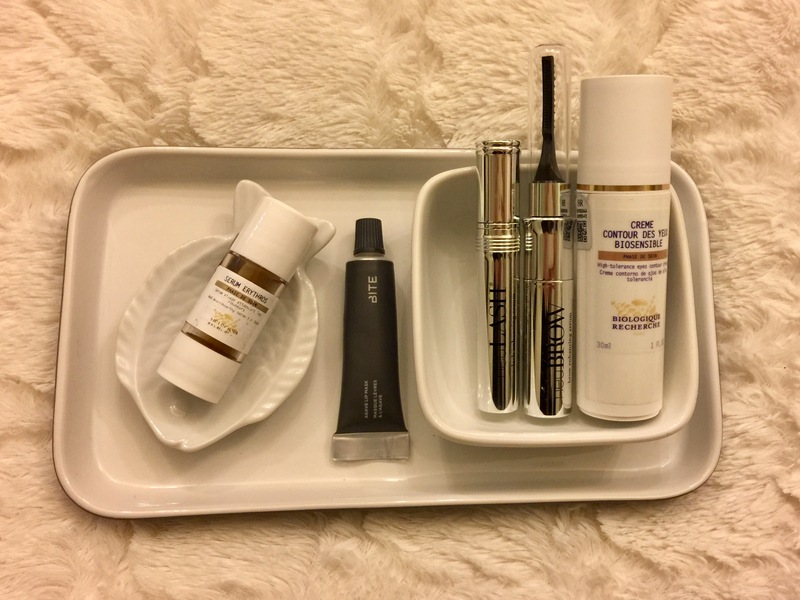 I am using my NeuLASH serum and NeuBROW serum regularly. Ok fine, I am obsessed and I use it every day. I’d be totally fine with Frida Kahlo brows. Giving your skin an extra goody at night only makes sense, overnight, your skin regenerates itself while you sleep. I’ll do anything I can to help it out. I add a thin layer of Creme Masque Vernix, all over my face and neck. It is rich in antioxidants, peptides and lipids. I also use an eye cream (Creme Contour des Yeux Biosensible) that helps to nourish my dry eye area and helps with my dark circles. 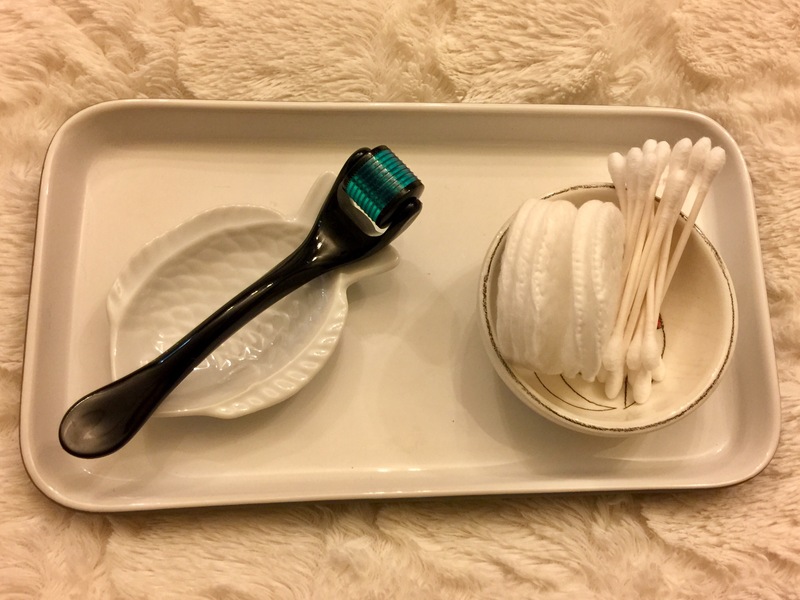 And I cannot go to bed without the ‘I-cannot-live-without’ lip mask (Bite Beauty Agave), it helped with my stint of exfoliating cheleitis and I never had better conditioned lips. I try to not wash my hair more than 2-3 times a week, I have fine hair but lots of it. I work out 6-7 times a week though and if I had a middle name, the name Dry Shampoo would certainly be in the running. 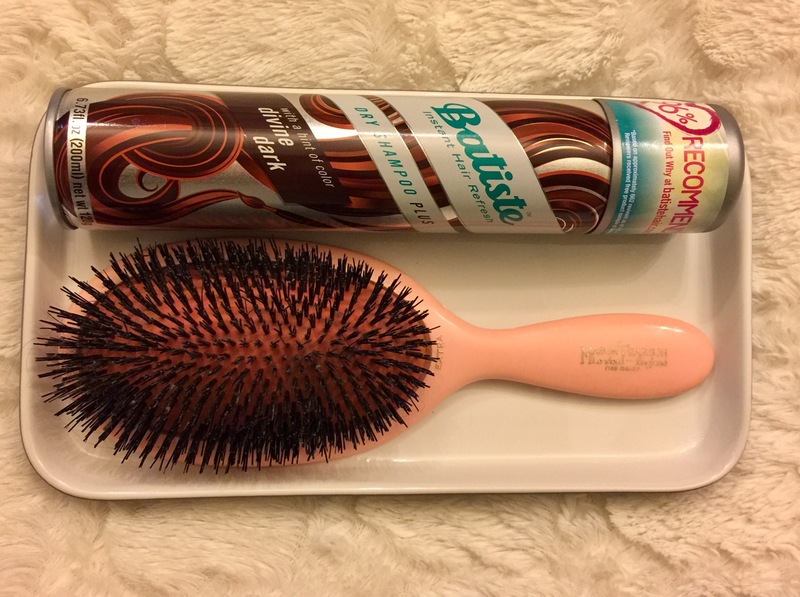 I started using Batiste when I traveled to the US from London Heathrow in December of 2009, believe me when I tell you that I was desperate to have my hair blown out, though I did not have enough time. I was activating my Green Card on this very flight and I wanted to look somewhat good for my Green Card picture that would be taken. In the beauty section of the airport Selfridges store I found Batiste Dry Shampoo and my life was forever changed. Anyhow, I spray a bit onto my scalp and let it sit, after a few I brush it out with my one and only Mason Pearson in pink (a gift from Daniel, he’s a keeper) and I bump my hair up in a bun and turn in. What I love most about a good nightly routine is that I wake up the next morning and my skin looks and feels amazing. It makes me believe that I accomplished something that helps my skin to be its best. I do change my routine frequently and depending on the season and I will update the routine as I go along. Disclosure: As part of my responsibility as Spa Director I receive product to evaluate. For this post I would like to thank Laura from Biologique Recherche and Angelica from NeuLASH/NeuBROW for their generosity. However, none of my links are affiliate links!